Your pup may wear a dog harness to safeguard their health and well being, but this doesn’t mean that they can’t look thoroughly awesome at the same time. Here’s our pick of the coolest dog harnesses for dogs large or small. We’ve kicked off our selection with this tough cotton, hand dyed dog harness from Found My Animal. 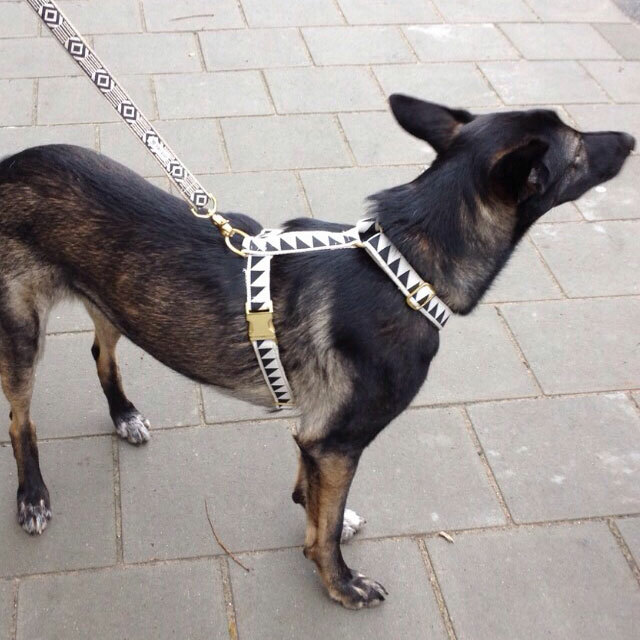 Handmade with love in Brooklyn NY, this hardwearing dog harness is double stitched for extra strength and finished with the brands signature brass ID tag. Also available in khaki and navy, add an adjustable rope dog lead to complete the look. Made in Switzerland by outdoor adventure experts Curli, this technologically advanced dog harness combines style with practicality. Constructed in 3D, these durable dog harnesses are finished with a unique rotating snap fastening. Curli also offer LED dog safety lights which easily attach to any dog harness, collar or lead. Adding a touch of fun to every walk, the Ware of the Dog signature colour block dog harness is surprisingly practical. Handmade in Brooklyn, NY with a timeless nod to fashion, these head turning neon harnesses are hardwearing, fully adjustable in 5 different places and machine washable. Matching leads also available. A hit amongst Hollywood’s celebrity dog lovers, these super soft leather dog harnesses are designed specifically with smaller pups in mind. Finished with Moshiqa’s signature gold embossed logo, this stunning cage harness guarantees your pup will be strutting their stuff with 100% confidence. As the camo trend continues, our next dog harness is technologically advanced in its construction whilst remaining effortlessly cool. Made using a lightweight stretch mesh fabric with unique cooling properties when immersed in water, this dog harness is the perfect outdoor accessory. Available in a variety of colours and materials. The Ferplast dog harness is made of non-toxic flexible rubber that is hypoallergenic, anti-UV, waterproof and washable. This ergonomic harness correctly distributes your dogs pulling force and the simple fastening does away with the hassle of buckles. Perfect for mud loving pups or those with sensitive skin. Available in black, purple and green. The Nice Grill dog harness from See Scout Sleep is guaranteed to get your pup noticed. 100% handmade in the U.S.A using geometric pattern ribbon sewn onto 100% natural hemp webbing, these statement dog harnesses can be adjusted in 5 different places, ensuring a perfect fit. Also available in red and white.